This weekend (Friday 3rd December, 4pm until Monday 6th December, 5pm) Filofax UK are offering a 20% discount on all organisers! Simply enter the promocode XMAS20 at the checkout to redeem your discount. Click on the advert below this weekend to see the full range and benefit from this discount, note the timing of this offer. Also over on the Filofax USA site. From now until 3/12/2010 or 3rd December 2010, if you spend more than $10 use the Promo Code CYBER3 to get free shipping. I heard your sigh of relief as soon as you read that.... why do you say it's rubbish Steve...? Well out of the box, it has a calendar application, but it only offers Day View, Month View and List View. The first two are ok, but the month view is as good as useless on such a small screen. 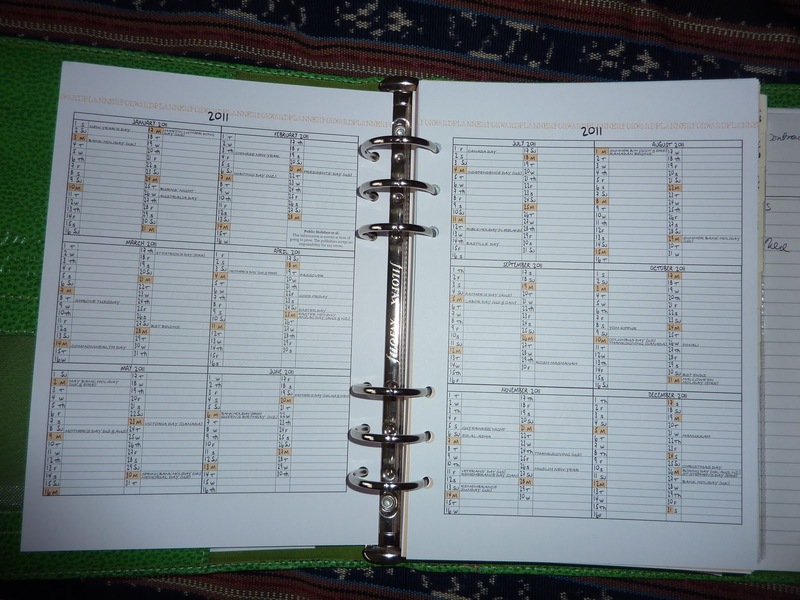 The big omission is a Week View, which as we know from our polls on here is the most used format for Filofax users... Week on Two pages is what we like most. There are other applications available to give me a Week View, but like so many of these things, working out which one to purchase is a mine field. Yes there are reviews, but they vary of Excellent 5 stars, to this is rubbish don't buy it 1 star. 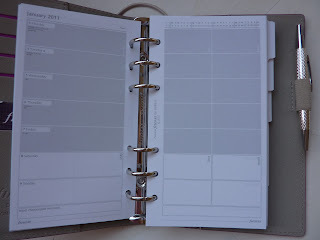 To be honest with you I didn't buy the Touch to replace my calendar or contact list in my Filofax, so I might not bother with all the hassle of trying out these other applications, they will be flawed in some way or other I'm sure. The Filofax is very tactile and you can see straight away what you are getting. It's true 'What You See Is What You Get', there is nothing hidden, it is what it is pure and simple. OK I know we would all like a layout that is personal to us with lots of space for this or for that, but in say personal size, but you can't alter physics, a particular size of page can only give you so much space to write on. An electronic screen is much the same, you can zoom in to see the detail, but then you can't see the other days around it! 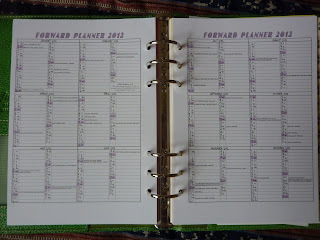 If you have looked at my own blog you will see that over the years I've gone through quite a few electronic organisers. They have all had their issues, and like different Filofax designs/sizes I wish I could pick the best bits from the ones I've owned and put them together in to one device, sadly that device will only exist in my dreams I suspect. So in the mean time I'm going to relax, and enjoy my (growing) Filofax collection... time for an audit and a change around, now where did I put my new Chameleon......which I spent more time deciding on compared to the iPod Touch! When? - Sunday 5th December from 11am (US East Coast time), 4pm London time, 5 pm Paris time etc. Please note this is an hour earlier than previous round-tables, the change of time is to see if we can capture some of the people that might have missed previous ones because of the clash of times with meal times etc. 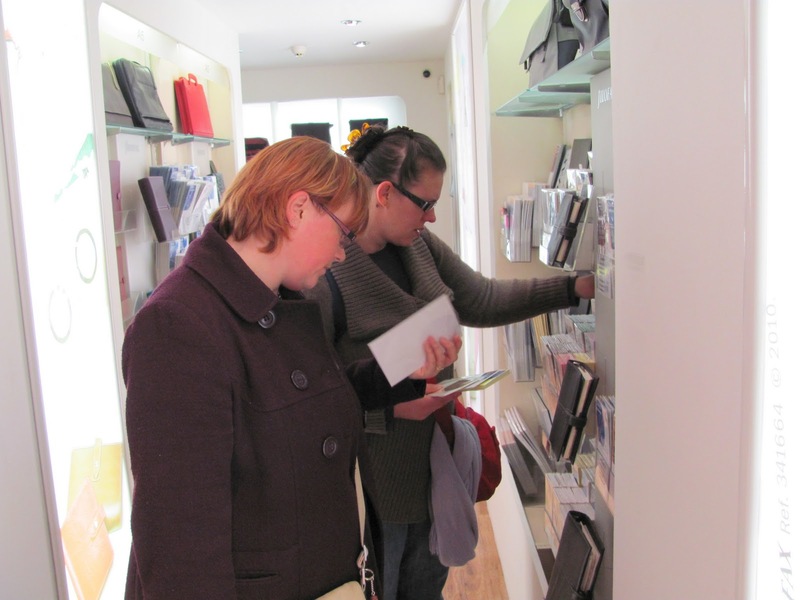 During my visit to the Filofax Neal Street store last weekend, I had the chance to compare the Malden and the Chameleon in my hands and not just on a website as I did in a previous post. Both of them were available in my preferred colour of black and in pocket size. I wanted something to replace my Finsbury Pocket in blue, which I use as my daily carry around Filofax/Wallet that you will have heard so much about earlier this year! This size has been working well for me... hard working in fact. The only downfall I've found with the Finsbury in this mode is that is only has two card pockets and with the pen loop on the right next to the zip pocket it tends to get in the way when I'm trying to retrieve coins from the pocket. The Chameleon solves both of these issues, minor though they might be. The left inside cover has 5 card slots, which is about the number of cards I have to carry here in France. Like the Finsbury there is a vertical pocket as well behind the card pockets, which will be able to take my UK passport and UK driving licence. The pen loop is also on this side, which frees up the zip pocket on the back cover for my Euro coins. The pen loop is a nice tight snug fit for my Filofax mini barley pen with no chance at the moment of it slipping out, which has happened a couple of times with the Finsbury. The pen loop is leather, but it has an elasticated part to it as well. Additionally there is a full width back pocket, which I use for Euro notes, not that I carry much cash! The Chameleon like the Malden is a full leather organiser, interior and exterior, so it should stand up to the day to day use it will get better than the Finsbury. The leather is lovely and soft and not stiff at all. As you can see in the pictures above it lays fairly flat from new. By choosing the black there isn't the 'two-tone' effect that there is with the other colours in this model. Personally I like the way that the leather edging has been finished off on the Chameleon better than the Malden. The additional card slots also swayed me towards the Chameleon as well. As you can see I've not moved over to the Chameleon as yet, I will start the 'move' this weekend, I want to also go through the current contents of my Finsbury and have a bit of a tidy up at the same time! The ring size on the Chameleon is slightly smaller than the Finsbury and Malden (15mm compared to 19mm) so I need to slim the contents down a little. As usual click on any of the photos to see them full size. Carribbean Princess's detailed review of her personal size Filofax Chameleon in pink is also worth a read if you haven't read it already. I write this having just arrived home from the traditional American Thanksgiving celebration. Or should I say "celebrations," since my husband and I visited both families. The day began with champagne at 11:30 a.m., followed by dinner at noon, sweets and more champagne after dinner, and then on to another house for another round of dessert at 4 p.m. I can hardly believe that I've eaten 3 kinds of pie—pumpkin, cranberry, and apple—and uncountable forms of chocolate. What does this have to do with Filofaxes? Well, my Filo did make an appearance—I had to pull it out after dinner to schedule a board meeting with my sister-in-law for an organization she and I are both involved with. Mixing a bit of work with play. I feel fortunate to have always had plenty of family around with whom to celebrate holidays like Thanksgiving and Christmas, but I've always been fascinated by people who celebrate in an alternative way. For example, for a few years my parents fed strangers instead of friends by working at a soup kitchen on Thanksgiving. Some folks like Mexican food instead of the turkey dinner. Let's share some stories! A more-recent American tradition is "Black Friday," the day after Thanksgiving, which is the official kick-off to the Christmas shopping season. Major retailers open at insane hours (like midnight or 3 a.m.), offering big discounts to shoppers (whose sanity is also in question, as far as I'm concerned). Using your Filofax as a travel journal is not a new thing. It's great to keep a record of your travels and where you visited, where you stayed, which restaurant you ate at etc. Filofax sell a Travel Journal Lifestyle pack that Laurie reviewed here and then put it to the test here. Helen told us how she used this pack for her European Adventures. 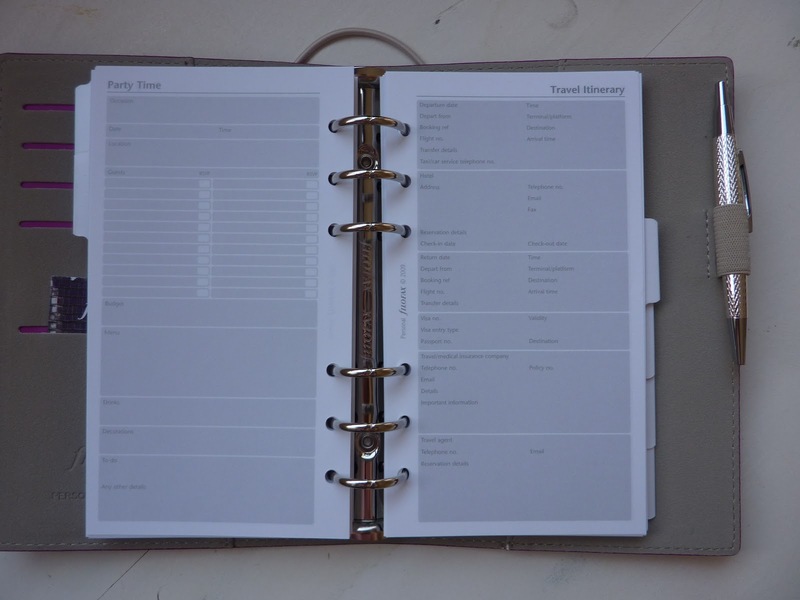 Today, Cathryn Cook published her own version of a Filofax as a Travel Journal, she hasn't used the Filofax Lifestyle Pack, but built up her own, which I think in some ways is more fun, also there's no point in filling your organiser with pages you know you aren't going to use. 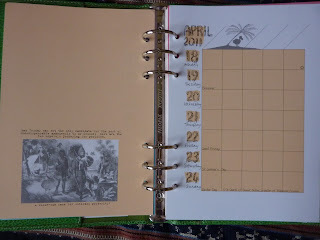 Cathryn also posted an earlier article about the way she decided on the contents of her own Travel Journal. So if you have a trip coming up at Christmas, or you are planning a big trip next summer, check out all of these posts. So much was discussed and we saw so many things in the shop on Saturday I was rather blown away by the whole day really. Thanks for all your great comments and thoughts on my earlier posts. So here are a few snippets of info that we have remembered from the day and I hope you find them interesting and useful for the future. Although not shown on the website the Filofax Shop had packs of pages for the Lifestyle packs, so if you ran out of a particular sheet they have additional ones. Contact Neal Street for details of what is available. 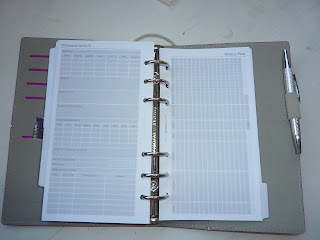 The Filofax Store sell the organisers without a refill, just the binder on it's own. Each one showed the price with or without the refill, from memory I think the saving was about £5. Some of the sales items in the store had to be seen to be believed. For instance they had a Pocket Waveley normal price £160 reduced to £40. The leather was very soft, I was tempted to buy it, but I don't think it would have stood up to the rough and tumble of being in my 'man bag'. Another sale item spotted - 'The Pocket Maroon Panama was a steal, reduced from £60.00 down to £20.00 which made a 'deluxe' Filofax cheaper than some of their entry level Filofax'. Seeing all of the organisers and refills in one place is quite breath taking. It's not like looking through a website, you need to allow more than an hour if you are going to do some serious browsing through the shop!! 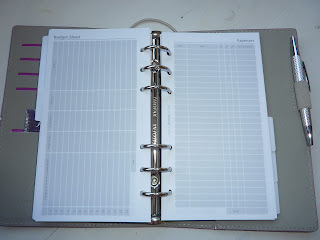 Please note: I said browsing... not buying, although I defy any Filofax fan to walk out without purchasing something!! She also suggests that you 'browse the website and write down the models and sizes you are interested in so if you don't have enough time you can check out your favourites. I am surprised at how much I preferred the Ruby Deco to the amethyst. If you are thinking of organising your own meet-up try to plan it as far ahead as possible. I got everyone talking together before hand by email. First of all I contacted each person individually to make sure they were happy to share their email address with others. Then I just CC'd in everyone who was attending in an introduction message, then they could just do a reply all to the message and it went to everyone. Filofax USA is offering some major cash and prizes, not to mention the production of your very own Filofax design, to the winners of their Designer Challenge! You have the chance to design your own Filofax, and if your design is selected, your Filofax will be added to the Filofax line of organizers! Click here to read the rules and to submit your design. So after the brief taster last night.... here is a more full detailed report from my own point of view. No doubt the other people that attended will also bloging about the meet up from their own perspective and we will post the links to these posts as we get to know about them. So my day started on Tunbridge Wells railway station, there was a bit of a feeling of deja vu about this. Back in the mid 1980's when I bought my first Filofax, I used to commute to London everyday from this station, I've rarely used this station since I stopping commuting to London every day in 1988. So the start of the day brought back memories of sitting on a train looking through a 1980's Filofax catalogue trying to make sense of it before I bought my first one back in 1985!!! The trains yesterday were running late due to engineering work, so nothing has changed really... so much for progress!! After we arrived at Charring Cross we headed for Covent Garden for a very quick visit to the Apple Store so I could buy an iPod Touch, I would have ordered it on-line, but we weren't in any one place long enough during our UK 'tour' / holiday. That done, we then headed over to Tate Modern, much along the route we would be following back to the Neal Street store. It was a bit of a cold damp day, nothing like the lovely weather we had back in April when I met up with Laurie, so we were walking at quite a brisk pace. I had a 'fully laden' camera rucksack with my camera, a bunch of Filofax organisers and other goodies as well as my netbook... mad I know but 'just in case'. We got to Tate Modern at about 12:45 and had a quick comfort stop and then we found a bench outside of the Cafe to sit at to wait for people to appear. BillyNoMates waits to see if anyone is going to turn up!!! Everyone (Oni, Karen, Kyla, Adam, Sharon) arrived within a few minutes of each other and Alison managed to get a table reserved for the eight of us without too much difficulty. We all trooped in and everyone was comfortably chatting with each other whilst we ordered food and drinks etc. Having eaten in the cafe before I knew the food would be good and also good value for money. Once the main course had been eaten and the plates cleared out of the way.... out came the Filofax organisers and the fun really started!!! I don't recall who's came out first... but I think it would need a 'photo finish' to detect which was the first etc.. because once one was out on the table being shown so the table just filled up and we were passing them around and walking about to chat and look and comment about them all. Kyla with someone's Filofax Mini... she thought it was so cute she sat holding it like that for several minutes! Time seemed to fly, because I suddenly realised that we were supposed to be at the Neal Street store for about 4pm and it was now 2:45 and we hadn't ordered deserts yet!! So Filofax Organisers were repacked in to bags and desert was ordered and consumed and then we got the bill out of the way and then we headed off for Neal Street as a big group of 8 people. I felt like the Pied Piper... leading at the front and making sure I hadn't lost any of the party... people were all chatting and joking with each other I don't think they realised the distance we walked. But all of us got to Neal Street together. And I wasn't far wrong, even I was quiet seeing so many Filofax Organisers in one place in so many different colours, it was just breath taking. One of our group (who I won't name!!) was smiling and giggling and hanging on to anybodies arm or hand for fear of getting carried away in the store... it would have been so easy to do serious damage to your credit card in there in the space of an hour!!! Again we grouped up to look around and discuss the pros and cons of different sizes and colours and styles. It was quite funny in some ways, other members of the public were still coming in to the shop to buy things, I'm not quite sure what they thought of us all laughing and joking and chatting away looking at virtually everything in the shop. 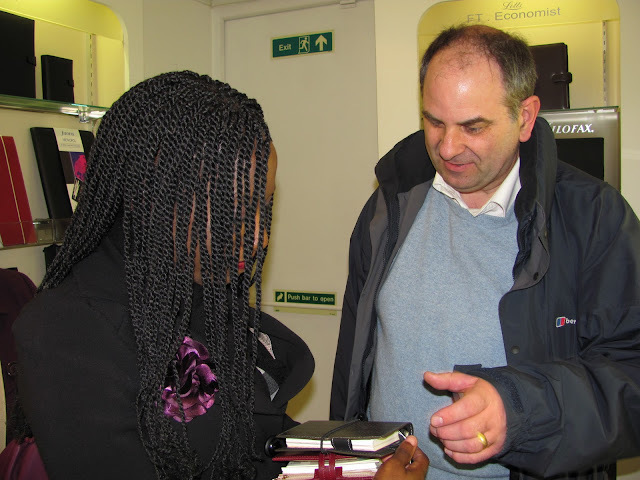 Dee the store manager was very patient and showed us some of the newer products and enjoyed chatting with us all. She attended to all of our purchases and when we opened out bags we all appeared to have some 'extra' things in them.... which was very very kind of her and her staff. I didn't note down what everyone bought... no doubt they will add a comment. Kyla (CP) had bought a shopping list with her... which on reflection was a good idea, I should have done the same really. In the end I talked myself in to buying a Pocket Chameleon in Black, which I will post about separately in the next week or so. I looked at other possibilities but I decided that that was the one for me in the end. 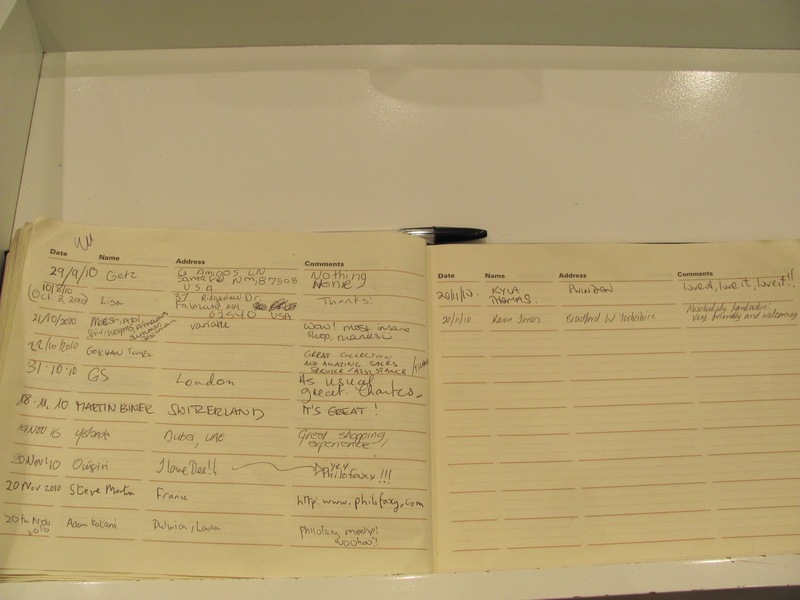 We also all signed the visitors book in the store and left some 'suitable' comments. As we all became 'shopped out' we all started planning our journeys home and we all had to say our good byes, but I don't think anyone went away disappointed from the day. I know by the time I got back to Tunbridge Wells I was fairly shattered and I just dived in to the shower and ordered up room service and then we both slept like 'logs' until this morning, but lots of great memories from the day when I started to look through the pictures and comments. When we left Tate Modern people in the group were already saying we need to do this again or at least every 4-6 months... and they hadn't even got to the shop at that point. But I totally agree I would love to meet up again, not just the same people but others as well. Someone even said we should do a meet up over two days! It was just great fun and everyone got on so well with each other it was if we had known each other for years, not 'minutes' A mad idea came in to my head (nothing new there!!!) I wonder if we could do a 'Summer Philofaxy Picnic in a Park' may be, although we would be putting a lot of faith in the London/English weather, but it could also be alot of fun. Whilst we were limited to a total group size of 10 people because of the size of the Neal Street store (quite narrow) the number seemed to work well. 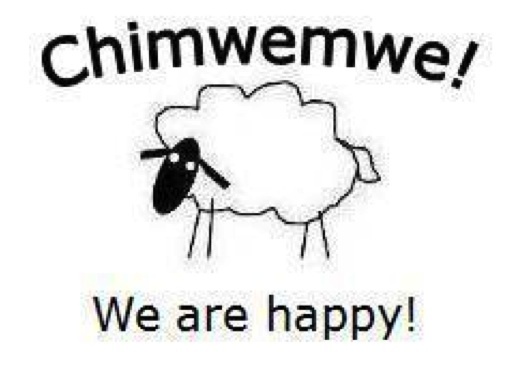 Anyway... as always I will have a think about another meet up and we will see what we can come up with for next time. Having met each other I think some of the people that came along might also be in touch with each other and may be meet up as well, which would be great. So thank you all for making it such a great day, and a big thank you also to Dee and her staff at Neal Street for letting us invade her store and letting us handle nearly every organiser on the shelves!! I'm certainly looking forward to the next meet up....are you? Oh and one last thing... Alison loved meeting everyone and she even said she is considering going back to using a Filofax again, we got to discuss which size would suit her best over breakfast this morning... guest post in the making I think!!!! Firstly thank you to everyone, those that were able to attend, and those of you who supported us, but were not able to attend. I think I'm right in saying we had a great afternoon together. 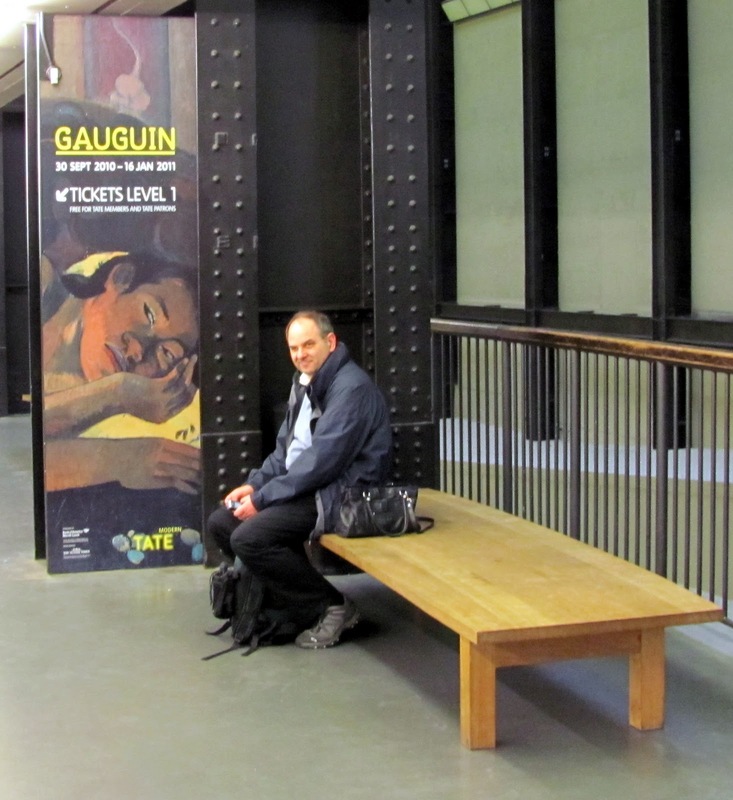 We started with lunch in Tate Modern. Lots of 'getting to know each other' discussions over the main course.... then in the pause before desert someone got out their Filofax.. and it started a whole trend of all of us getting out Filofax organisers of different styles sizes etc... people had to be reminded of the time and to order desert!!! The picture to the right is during our 'Filofax Course' part of our meal together! Don't worry I will put names to all the faces in the pictures in my full report. At about 3:30 we started making our way along the embankment, it was a bit like a school trip, I had to keep doing a head count to make sure we hadn't lost anyone!! 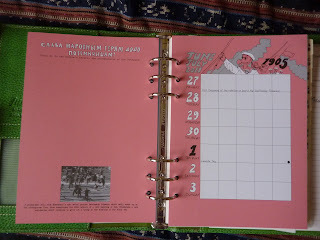 But we navigated our way along a very crowded South Bank of the River Thames towards Waterloo Bridge and then across the bridge and in to the busy crowded streets of Covent Garden to the Filofax Shop in Neal Street. 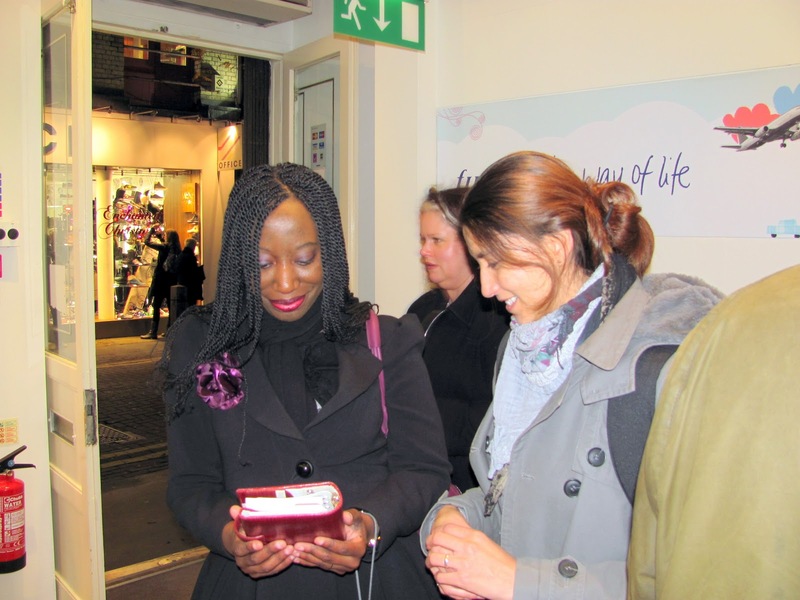 We then more or less took over the shop and had a great time looking at all of the different models, some of the sale items on offer and chatting with the shop staff. As 6pm approached we all said our good byes and headed off in different directions for trains home. I know by the time I got back to my hotel in Tunbridge Wells, I was tired and shattered, but after a shower and a beer I started to reflect on the day and everything we did and said. What a great day and it will be one I will remember for a long time. So this is short and sweet, I will expand on all parts of our day in my more complete post and I'm sure you will be smiling when you see some of the photos of the day. Again thank you to you all, you all made it happen, and I'm sure we will be doing this again soon. 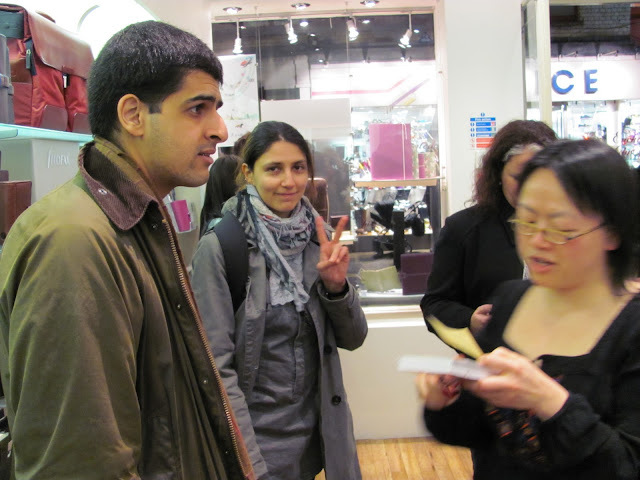 I'm very excited about the Philofaxy meetup in London tomorrow! I'm really looking forward to meeting you all. 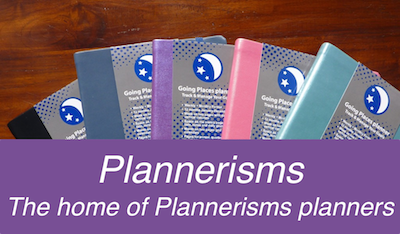 As always on Fridays, feel free to leave a comment about anything Filofax-related. 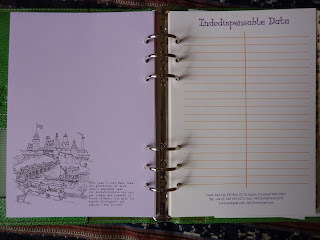 This A5 Filofax compatible Dodo Pad diary insert was graciously sent to me as a sample by Rebecca at Dodo Pad. Many thanks to Rebecca! 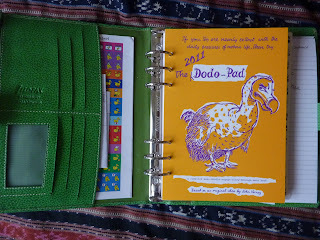 The Dodo Pad diary has been a fixture in British households for nearly 45 years and counting. It started as the original desk size diary, and now comes in a variety of sizes and formats including this A5 Filofax-compatible insert. And just plain fun stuff like International Talk Like a Pirate Day! 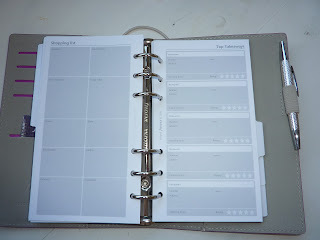 The week is set up in a grid format so that you can track each member of the family, or alternatively use the daily boxes for morning/ afternoon/ evening/ to dos, or any number of ways. You could even use it differently each week. Inside the back of the diary there is more space for notes, and a very convenient list for "Indodispensable Data" such as quick-reference phone numbers etc. 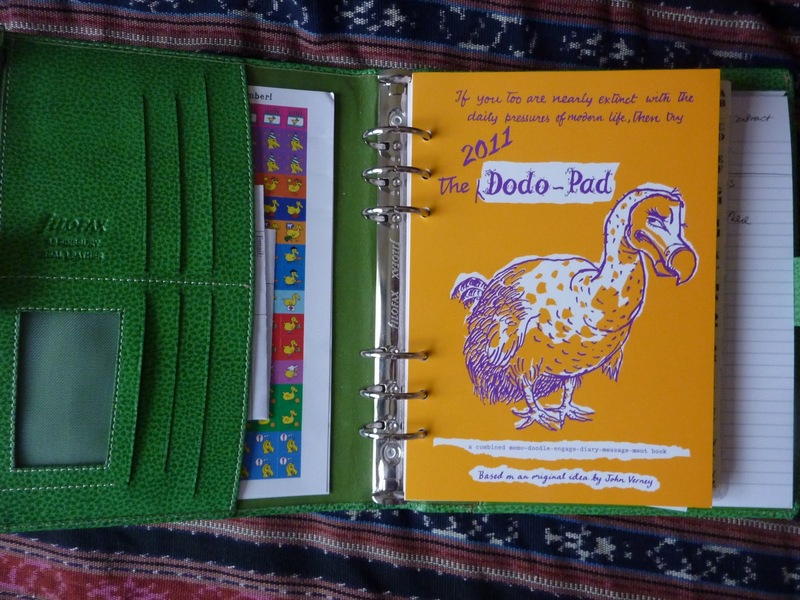 So if you're bored of the same old diary layouts, tired of your oh-so-serious diary inserts, or just want to add some fun to your Filofax, I highly recommend the Dodo Pad diary Filofax inserts! I'm bringing this with me to the Philofaxy meetup this weekend so you Philofaxers attending can check it out! 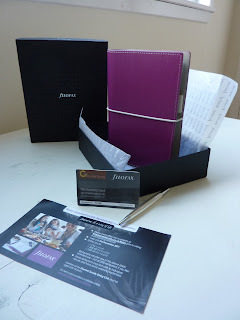 My video of the Filofax Gourmet Gift Box is up on the Filofax UK website! Here is a form I thought you might like to post on the site. 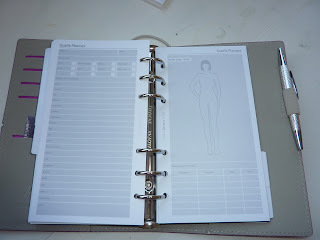 For 2011 I ordered the personal size 2 page per day. I was not able to order it for 2010 but I still wanted to see if I would like using that format, so I created a similar page with 10 todo lines on the top, and some lines for notes on the bottom. It prints out double sided on Letter size paper, so you can cut them out and place one sheet between each of the dpp sheets to create 2ppd. When printing the pdf, the pages seem to line up best if you turn off any fit to page settings, but have the auto rotate and center setting on. Thanks Philofaxy!! If any of you have any files you wish to share with other readers please email them to us. Yes, I know we all dream of Filofaxes, but last night I literally saw mine in a dream. In the dream, I had the 2 filos I might normally carry in my handbag...my red Person Finsbury and my pocket fitness turquoise Finsbury. I was stopped by the police (lots of them) for speeding in a mall parking lot. They gave me a battery of tests, testing my reflexes, etc. to make sure I was fit to drive. I passed all the tests, but no one would tell me what the speed limit in the parking lot was or how fast I had been going. When the police left, there was one man who stayed with me--a very friendly mall security guard. He and I spent the day at the mall, making friends with other people, and he was very protective of me the whole time. I trusted him. At the end of the dream, he and I were hanging out outside the mall with some other people, and he asked me to go inside and introduce myself to another mall employee. When I came back, everybody was gone, including him, and I realized I had left my handbag on a bench. The filos had been taken out, and all my cards were missing. I screamed! My identity had been stolen! In the case of the pocket, he had stolen my diary pages, too. I realized he had gained my trust, planning to steal my identity the whole time. I woke up this morning thinking that I had to start calling the credit card companies before I realized it was a dream. I came across my pack of stickers the other day... unopened. 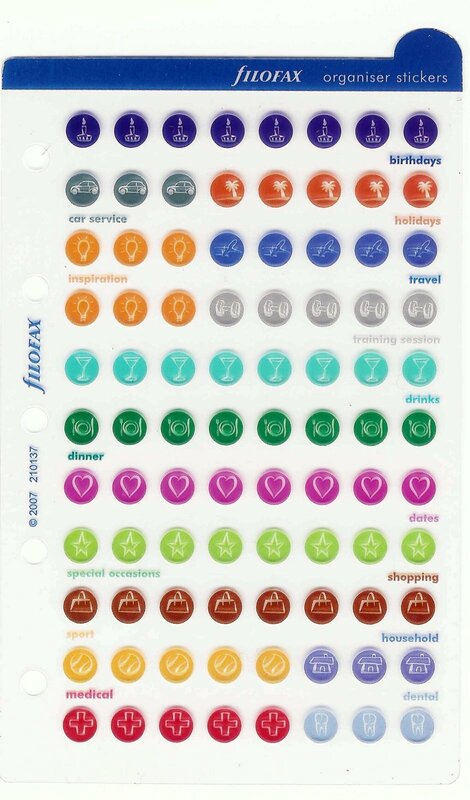 Do any of you use stickers in your diary on a regular basis? 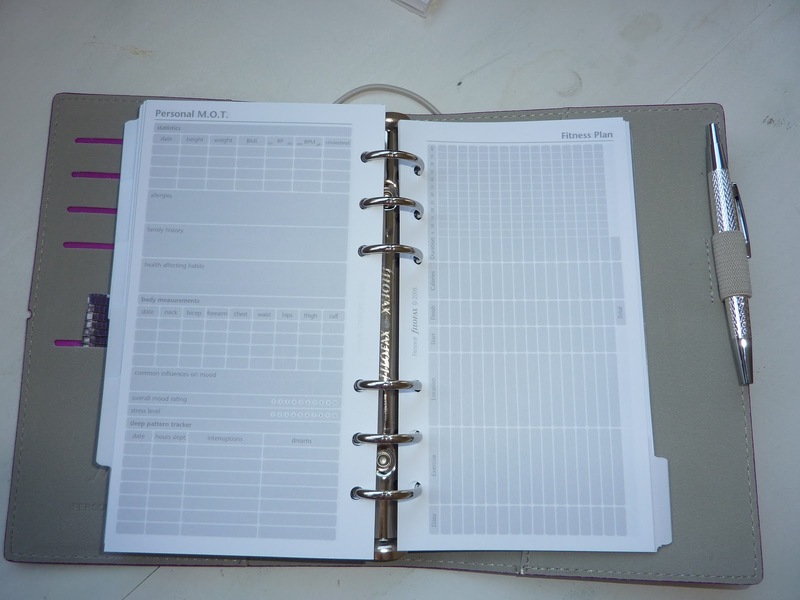 20% off all Filofax organisers and free UK postage from The Pen Shop! 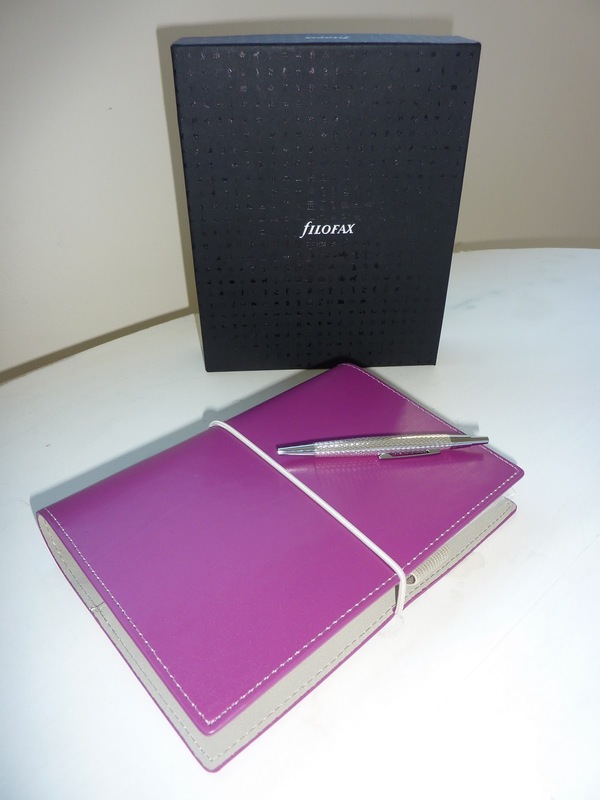 Get 20% off all Filofax organisers, conference folders, briefcases, bags (!) and small leather accessories at The Pen Shop in Jenners department store in Edinburgh. 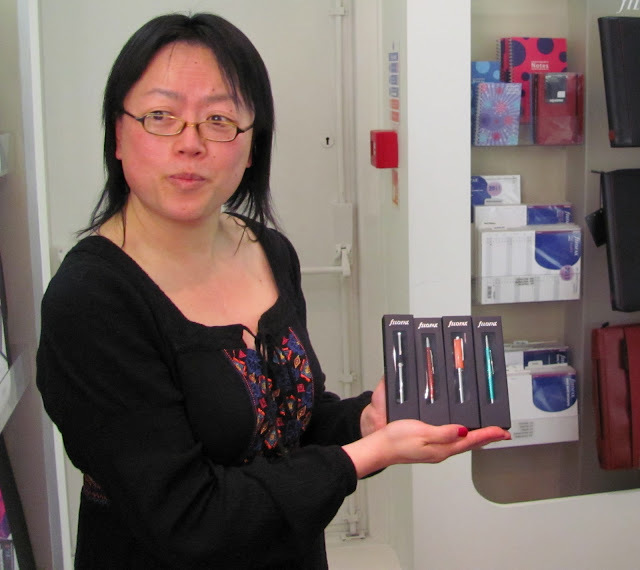 The Pen Shop carries almost the entire Filofax range so you should find what you are looking for there. For those of you who don't live in or near Edinburgh, this offer also applies to phone orders, with free UK shipping! Just quote the word "Philofaxy" when you place your order over the phone to get your free UK shipping. There are also discounts available for overseas shipping too! But you have to hurry, this offer is only through November 21st. So don't wait! Many thanks to Craig for letting us know about this fantastic discount! Alan emailed me some pictures of the Avon Filofax that we mentioned last week. Well he ordered one, but I don't think he is terribly impressed with it. It's hardly what we would know as a Filofax with a full fill in it. So yesterday was the first of our 'regular' Skype Roundtable chats, if you recall we have decided to do these on a regular basis now on the first Sunday of every month. So if you miss one, it's not quite so long until the next one. We had some new people joining in yesterday as well as some of the 'regulars' and I hope it was as enjoyable for everyone as it was for me. People joining in for the first time might have taken a few minutes to adjust to this format of on-line discussion, but after they got settled down it all seemed to flow very smoothly. I really value all the questions and comments, it's a great form of feedback and helps me when it comes to writing new articles, in particular how much detail to go in to, and this was highlighted yesterday on one small point, so I have a note written down to post an article with pictures about punching A5 with a non-A5 punch. 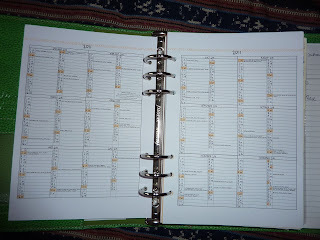 As usual for this time of year there was quite a bit of discussion about diary formats and we were able to give people a few pointers of sources of different refills and formats. Quite a bit of discussion took place about the London meeting on the 20th November, all the people that will be attending that were on the discussion yesterday were swapping details about what Filofax Organisers they would be bringing along. So it will be a great day I'm sure. 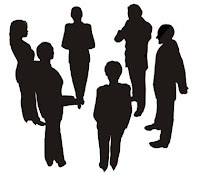 If any of you find the timing of the roundtables clash with your Sunday routine because of where you are in the world, please pop in a comment on this post and we will try to adjust the schedule a little, but please remember the spread of people around the globe that take part is quite wide. Today I'm going to be busy ticking things off my packing list for my trip back to UK and the wind and rain are coming down outside so it's time to dig out Winter coats I think! Many thanks to Filofax UK for sending me the Filofax Gourmet Gift Box to review! It is an excellent product and I think it will be a great gift. 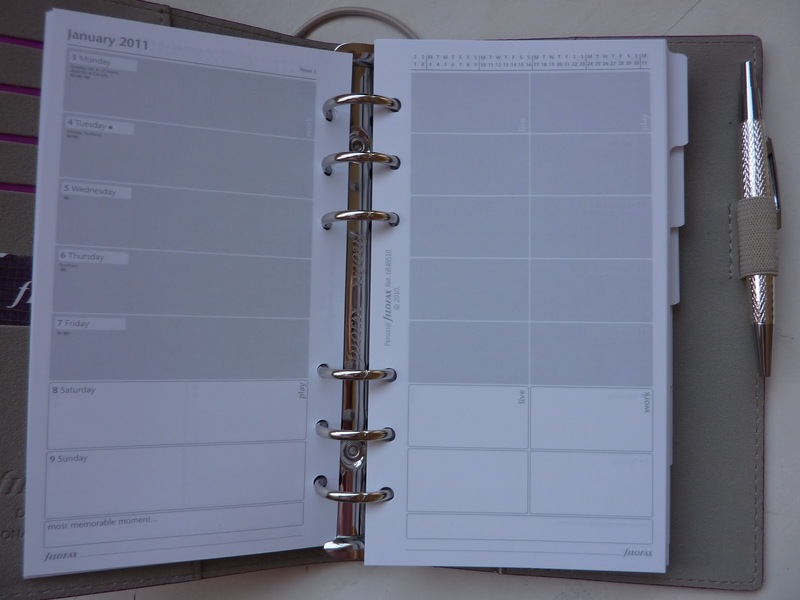 4) a complimentary 2010 weekly diary so you can start using it right away, and the Domino is pre-loaded with the City Dweller Lifestyle Pack for 2011 (worth 17 pounds) which has a unique weekly diary layout and loads of other inserts. 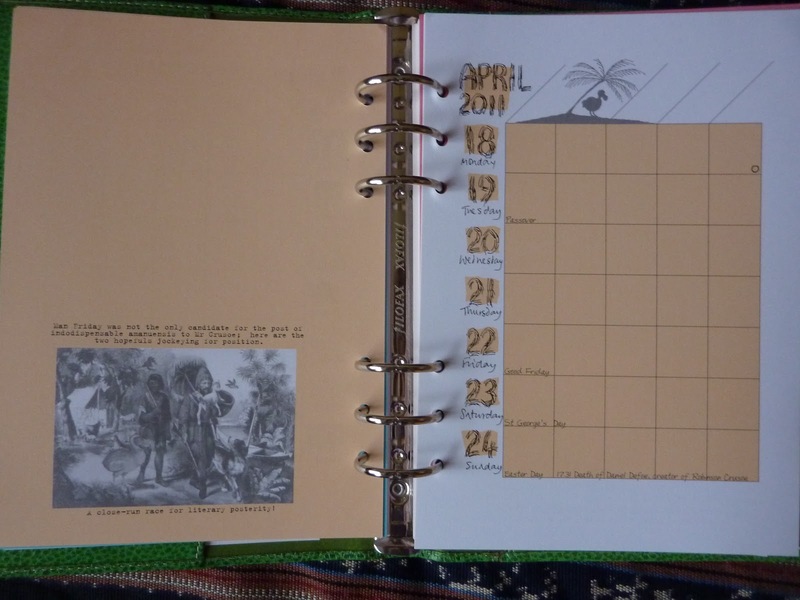 You can see inside the pages of the City Dweller pack on the Filofax UK website (click here). 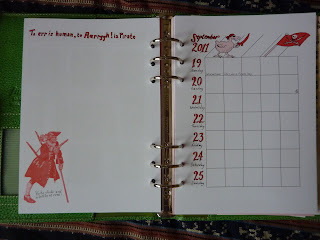 Weekly diary pages with a very interesting and unique layout. Personal MOT and Fitness plan. Shopping lists and, if you can't be bothered to shop and cook, lists for your favorite takeout restaurants. 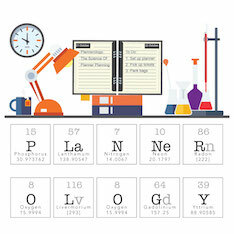 Party planning and travel itinerary pages. There are also contacts pages, address pages, tabbed dividers, and loads more. 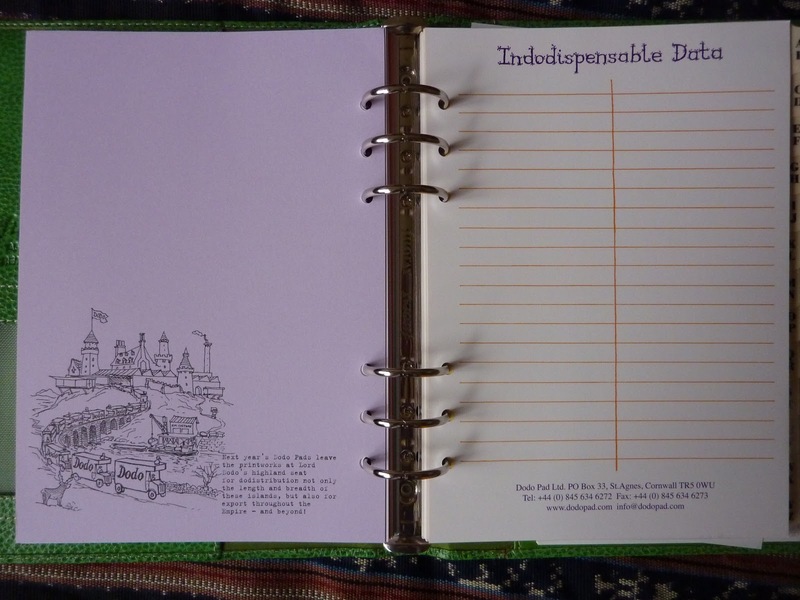 You can see inside the pages of the City Dweller pack on the Filofax UK website (click here). 5) A free 12 month membership to the Gourmet Society UK, which gives you discounts on meals at restaurants all across the UK. You get all of that, for the now-discounted price of only 38 pounds!! That's more than worth it even if you never use the Gourmet Society discount card. But I highly recommend you do use the discount card, because it is super-easy to use and find a participating restaurant near you. I had a couple of concerns about the Gourmet Society membership before I started to use it. First of all, I thought there wouldn't be a restaurant anywhere near the small village I live in and that I'd have to travel the 30 or so minutes to Aberdeen to find a participating restaurant. Also, I worried that only high-end restaurants were participating and that I wouldn't be able to find one in my price range. I'm very happy to report that I was wrong on both accounts. There are definitely higher-end restaurants, but there are also family eating establishments and even national chains, so there are restaurants available for a wide range of budgets. Also, using the easy restaurant locator on the Gourmet Society UK website, I discovered a participating restaurant literally within walking distance of my house here in our village! There are several in our area, and of course loads in the city. It was very easy to make my reservation using my card, and the restaurant staff were very friendly and welcoming. Using our card was very easy, and we got a great discount on our meal! 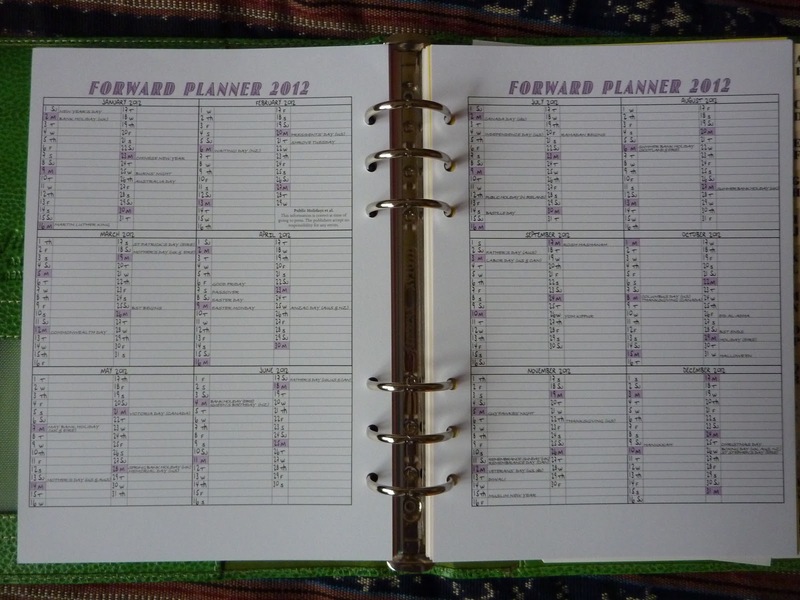 I think this is an excellent gift for a man or woman, indeed anyone who wants to be organized and get great discounts at restaurants for all of 2011! 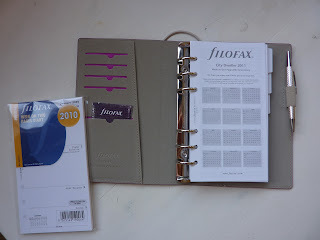 Many thanks again to Filofax UK! 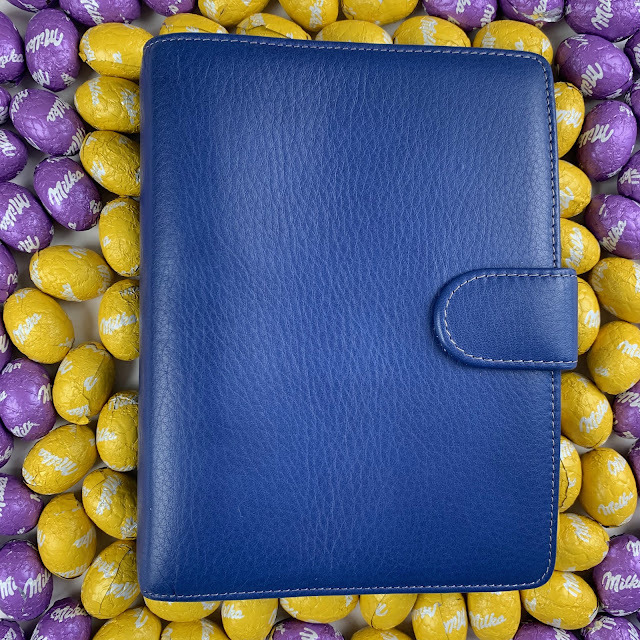 Is your Filofax just for you? Filofax offers in Tesco and elsewhere..